James A. Garfield has sometimes been described as the best president we never had. That is speculation, whether informed or not. The fact beyond speculation is that Mr. Garfield is the only U. S. President to publish an original proof for a major mathematical theorem. 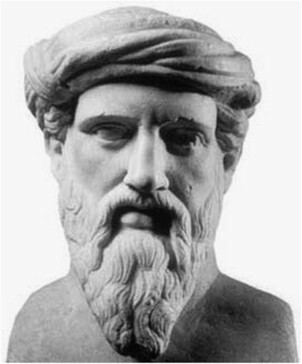 The Theorem is named for Pythagoras, who gets credit for about everything that happened in ancient Greek mathematics, since we don’t have many names from that time, and his name graces the most famous of ancient mathematical cultures. His theorem is also known as Euclid's 47th proposition, a fact less known but important to Garfield's proof. 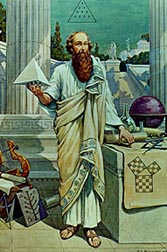 Pythagoras (569-500 B. C. E) was born on the island of Samos in Greece. He studied in Egypt, ancient even at that time, and founded the Brotherhood of Pythagoreans, a mystical cult of numbers. 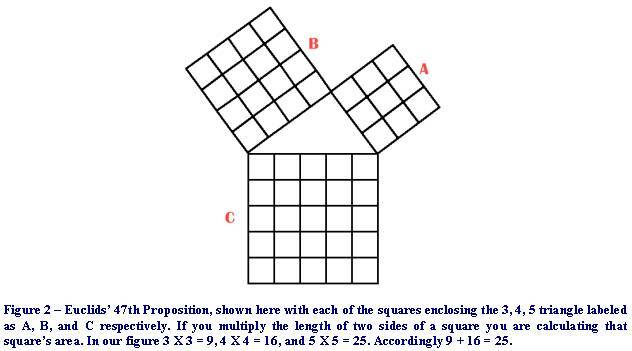 The Pythagorean Theorem was codified by the Pythagorean school, was widely known across the ancient world, and comes down to present times as the ubiquitous participant in almost all of science and mathematics. It might be the most widely proved theorem in mathematics, and the only one for which an original proof was offered by an American president. 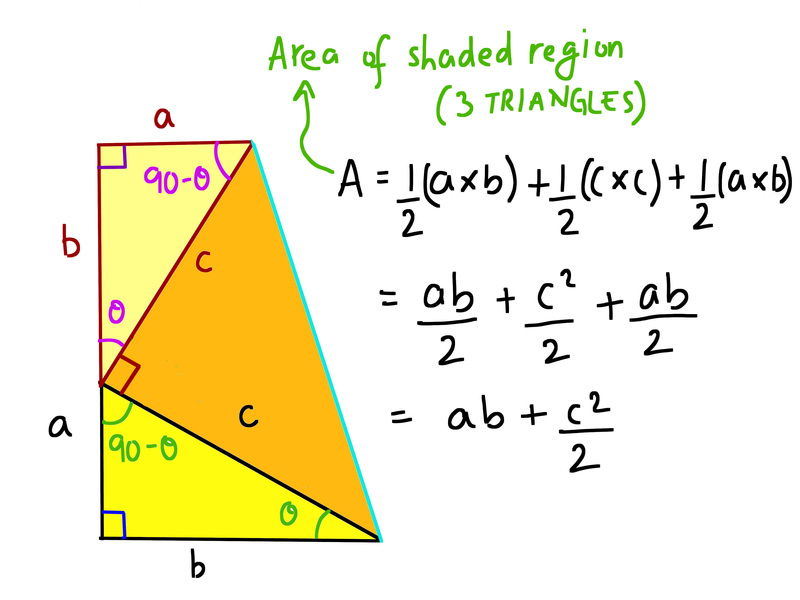 One cannot study any branch of mathematics or science for very long without encountering the Pythagorean relationship between the sides of a right triangle. That is because almost all spatial references involve systems of coordinates that rest on right angles. Finding ones way through such a maze of ninety-degree turns must involve invoking Pythagoras. Even Einstein gave it a go at an early age. Mr. Garfield proposed his unique proof while discussing mathematics with his fellow members of Congress, in 1876. Few things more clearly illustrate the vast disconnect between that time and ours, than the idea of members of the United States Congress discussing mathematical proofs as a means of recreation. Yet, that seems to have been exactly what was happening when Garfield first revealed his proof. He later had it published. What does that have to do with Euclid's 47th proposition? Mr. Garfield was a Freemason, and Euclid's 47th Proposition occupies a central place in certain Masonic ritual, according to those who claim to know about the inner secrets of the organization. The Garfield proof, like all others, flows from a construction of geometric shapes around the basic construction of the Pythagorean Theorem. Proof of Euclid's 47th Proposition, as demonstrated by James A. Garfield. 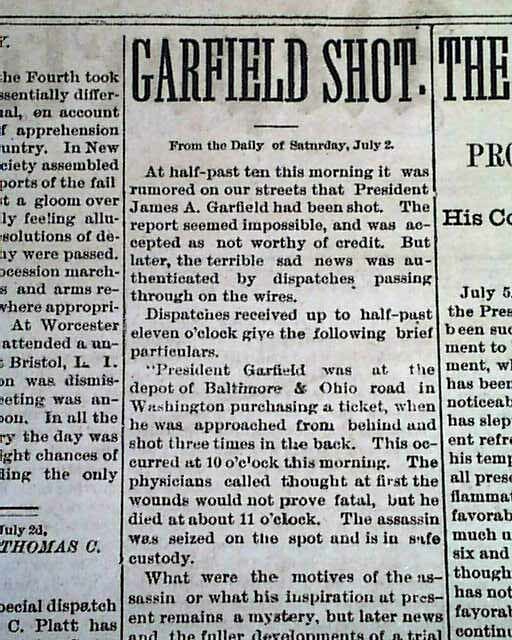 Mr. Garfield, as we learned in American History, was the second president to leave office by assassination. He served only 200 days, and his killer exclaimed as he was taken into custody, “Now Arthur will be president.” The assassin was not referring to the King of the Round Table, as delusional as he seems to have been, but to Chester A. Arthur, 21st President, the Vice President at the time, and previously the Customs Collector of New York. 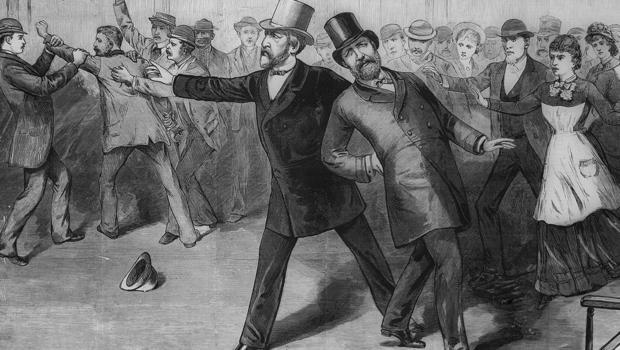 All of this is discussed at length in “Dark Horse: The Surprise Election and Political Murder of President James A. Garfield,” by Kenneth D. Ackerman. Also discussed is President Garfield's medical care, which almost certainly killed him.